Team building in the Lake District. Activate the hidden potential of your staff with an Outdoor Adventure Company corporate team building experience in the Lake District. 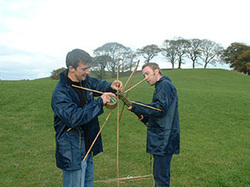 We have numerous team building challenges lasting between 15 minutes and two days, each designed to challenge in a different way and provides the spark for people evolution. A combination of these projects along with facilitated reviews of performance leads to significant changes in team building success. 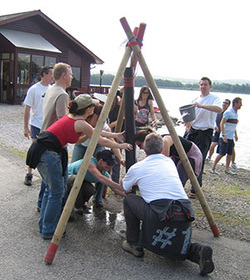 As well as the tasks listed we have a wide range of shorter activities for your team building in the Lake District. This is a perennial favourite involving communication and leadership skills together with exhilaration and laughter! 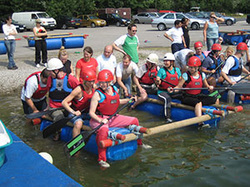 The challenge brings your team together to construct a raft out of a variety of equipment. Once the rafts have been constructed it is a race against the clock across the lake/tarn to the buoy and back to dry land! First team to make it back with their Raft still intact and their passengers still afloat WINS! The team of climbers from abseiling also guide you onto our 120 foot zip wire which stretches 450 feet across our quarry, entering speeds in excess of 45kph. From personal experience, this fast drop across such a height at speed sends your adrenalin to unbelievable levels leaving you wanting more and totally exhilarated with the experience. 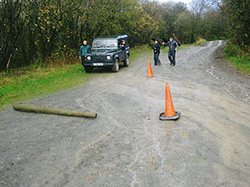 A team member must drive the vehicle blindfolded taking instructions from their fellow team members to complete the obstacle course. Specifically designed to promote greater communication skills between team members. A team member is blindfolded and with only radio contact with their fellow team members must listen carefully to the team to complete the challenge of balancing the ball on the traffic cone - this is a lot harder than you may think! Again encourages good communication skills between the team. Objective - The teams are informed of an accident involving a casualty, their whereabouts unknown. It is the teams mission to locate (somewhere in our 300 acre site) the casualty as quickly as possible. The teams are given a grid reference to input into their GPS personal navigation unit. On arriving at the grid reference a number card must be found and retained. Once the team have found their number the instructor will give you the next grid reference. There are five numbers to collect. When all five numbers have been handed to the instructor, the final grid reference to locate the casualty will be given. The first team to locate the casualty wins the challenge. Teamwork and sheer nerve is required to complete this task. How high are you prepared to go? This is a fantastic activity, whether you are looking for a great experience with a group of friends or a team in the workplace. You will be guaranteed to have a giggle you will never forget! It is essential for this activity to be a success, that delegates work together closely as a team. The Lakeland fells are home to thousands of sheep and our local town of Kendal was built on the wool trade, the towns motto is "wool is my bread". 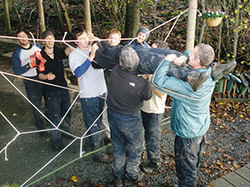 This is an 'out of the ordinary' team building event linked with the surrounding Lakeland area. In the tube suspended from the tripod is a ball which must be removed from the tube by you "the team" to complete this task. You have all the equipment you need to complete the task ahead. 1. The tube must remain suspended from the tripod. 2. The tripod must not be altered structurally in any way. 3. The ball must be in the hands of the team to complete the challenge. 4. Bung must not be removed from the bottom of the pipe. Your task is to design and build a trebuchet capable of launching an egg. Each team will get one chance to launch their egg. The egg to travel the furthest distance will be the winner. It must be free standing but may be secured in a safe manner by the team. You as a team can put physical forces into the machine (i.e. pull it back) but it must launch using its own energy. The trebuchet must be free standing. At the end of this period all work will stop on the trebuchets. A final "Launch off" will be held at the end of the day to decide a winner. 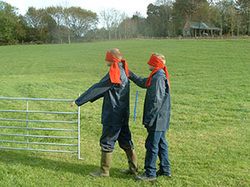 Your task is to guide your blind folded team members through a course in the quickest time possible. No verbal communication or contact may be used. Each team must formulate a system, they must also decide a team leader to work together and achieve there goal.. Your task is to untie the knot that your instructor has tied in the rope and then re-tie it again. Once you have got hold of the rope you may not release it until the task is completed. This challenge will be performed against the clock! Your challenge is to travel across the course with your feet inside the bindings on the ski's provided. The first team member must manoeuvre the skis by the approved method to points marked out in front of you. At each point, a team member will be waiting and must be 'picked up' by the team and added to the skis as described above. Once all the team members are on board, you must round the marker at the top of the course and head back to the start point. The web before you is divided into two sections, Red and Blue. The gaps between the cord in the red zone are worth more (points) than the gaps in the blue zone. You must send team members from one end of the web to the other. Each team member must pass through 5 gaps without the bell being sounded. You will have 10 minutes to practice before you will be awarded 15 minutes to get as many team members through the web as possible. - 5 gaps must be passed through by each person. Your task is to bridge the gap between the 2 barrels using only the 2 long planks. 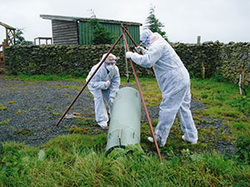 Neither the planks nor the team members may touch the ground between the barrels during the exercise. All the team members must cross the gap and the fastest team time is the winner. Your task is to position the counties in the correct location to complete the map. Points are awarded for each successfully positioned county. However, the map has been sabotaged and three counties have been removed. Extra points will be awarded if the team can guess which three counties are missing. This challenge will be performed against the clock!!! Welcome to the Gatebeck Glacier. Over the next 15 minutes your team will embark upon an icy journey from one side of the 'ice field' to the other. Equipped with two ladders, your group will soon discover that the route is not as straight forward as you may have first thought. 1. The ladders are two different lengths and can only be used alternately to bridge the gaps. 2. All team members must be in contact with either a ladder of one of the ice pillars for the duration of the crossing. 3. The first two team members to cross ( the 'leader' and the 'second') will be fitted with harnesses and tied together as per alpine mountaineering tradition. 4. Any team member who loses contact with the ladders or the ice pillars will be out of the challenge. 5. The winning team will be the quickest to cross with all members safe and well at the other side. 6. Ladders cannot be joined together. Your task will finish 15 minutes from now. Using the blocks you must build a tower, the base must be 3 blocks wide. Points are scored by removing the blocks after the tower has been built without the tower collapsing - the more blocks you remove the more points you will score. The team(s) are responsible for the organisation and creation of a news broadcast, this involves researching, presentation skills and real teamwork. Once complete they must showcase their broadcast to the rival team(s).